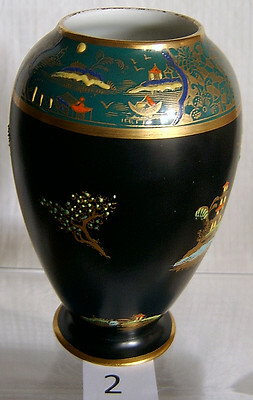 This is one of 2 (probably a pair though the decoration is slightly different) of beautifully enamelled Mikado Vases manufactured by W. & R. Carlton Ware in the 1920s. 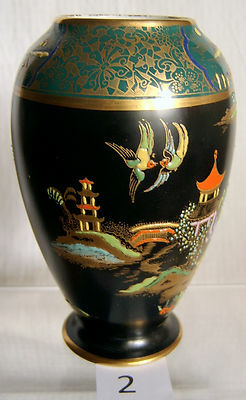 Each one has a gloss black ground upon which is a whole range of oriental objects and Chinoiserie scenes. 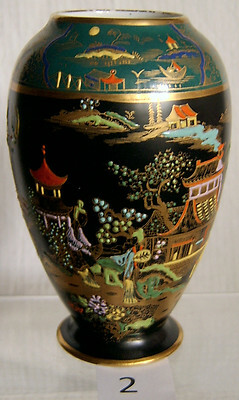 Around the top rim of the vase is about a one inch frieze set on a gloss green background, again depicting the chinoiseries styles to include a yellow sun. On the main body decoration this vase includes a pair of Kissing Doves , very popular with collectors today. This piece is in really excellent condition with no rubbing to the main gilding, the enamelling is still exceptionally vibrant. There is some minor rubbing around the rim. It measures 5.5 inches (14cms) in height. 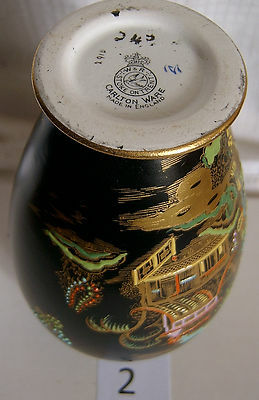 It is backstamped appropriately with the W & R Carlton Ware backstamp with pattern number 2910. I am happy to send further photos if required. As indicated, I have 2 of these vases (currently) and would consider a discounted price for the pair should a buyer be interested. This would cut down on postage costs, as both items would fit securely into an export shipping box. UK delivery is FREE OF CHARGE although it is recommended that the buyer considers tracked and insured delivery. Overseas airmail starts at £8.95, again using International Signed For would be the more appropriate shipping service. Payment should be by PayPal or it can be by cheque or uncrossed Postal Order (UK only).